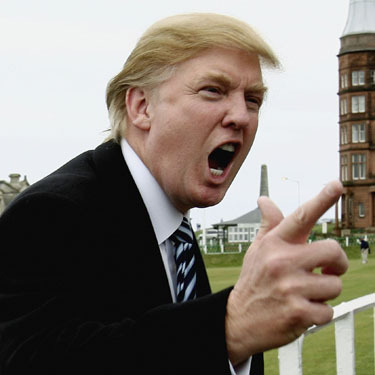 The Midnight Review: Should Donald Trump Run For President? Debating whether or not to run for the presidency is the newest political fad. Numerous potential candidates are mulling over the possibilities of mounting a campaign, and in doing so launching a pseudo-campaign - an off-the-grid attempt to soak up some cash and gauge voter temperment. One particular candidate should be on everybody's watch list, and no I don't mean Sarah Palin. If you are intelligent and read the title of this piece, then you would know that I am talking about Donald Trump. Unlike the other potential candidates, Trump is doing the most non-commited out-loud thinking, and recently, he discussed financing and party selection. During an appearance on ABC's "Good Morning America" on Thursday, March 17th, the savvy real estate mogul and reality television star stated that he would spend up to $600 million of his own money on his campaign. "Part of the beauty of me is that I'm very rich," said Trump. "So if I need $600 million, I can put $600 million myself. That's a huge advantage. I must tell you, that's a huge advantage over the other candidates." Trump also indicated that if he fails to capture the Republican primary, he may consider an independent run. If that is the case, I believe Obama will surely win. In a two-way race, with Trump being the Republican candidate, I think he would have a pretty decent shot - better then any other Republican - but in a three-way-race, Trump would siphon more votes from the Republicans, giving Democrats the win. Sure Trump may take in some of the idiot vote, or those who would vote on Trump because of his celebrity status, similar to those who voted for Linda McMahon for her connection with professional wrestling and nothing else, but when the candidates start talking policy, with Trump being the straight shooter, would steal members of the Republican persuasion. Tea party candidates would love him because he is a rich free-market political outsider, and conservatives in general would love him because of his general positions - the only group he may have trouble with would be the religious right, who may have a problem with Trump's personal life, but then again, who else would they vote for? Considering Trump's statements regarding the other potential Republican candidates, I would think the strongest Republican ticket with Trump's name on it would be with Mitt Romney as his running mate. As an independent, I would see Ron Paul or Mike Huckabee as a viable vice-presidential option - Trump would probably come in second, taking in a greater percentage of voters then Ross Perot did in the nineties. Oh God, why not run? The GOP already has the quitter, the cheater, and numerous liars...why not a man who's had multiple wives, made and lost fortunes, and doesn't know anything about much of anything? Who's next? Mickey Mouse? If Obama can't take these morons with barely campaigning, I guess we deserve the Walkers and the Snyders and the Palins.